The series 'Against All Odds: In Search of a Miracle' by M Greenspan, reveals God's involvement in present day Israel to save it. Beautiful account of God's Divine Intervention as well as exciting . Free series on YT, fyi. It is in context and clear as a bell. Salvation to the Jews first we are grafted in. Jews did not believe, they are blinded until the Gentiles come in. A remnant will be saved. You are transferring Paul's statements 2000 years into the future which is out of context. Only a remnant was to be saved, when Paul states all Israel will be saved he's speaking of all the remnant otherwise you have him contradicting himself. The short work was over and done with in the 1st century AD. Not false doctrines - look at the book of revelation, there is no indication of an "all Israel shall be saved" there is only the remnant - 144,000, 12,000 of each tribe saved. Zech 13:8-9 At the end only 1/3 Jews will survive, in Israel, and they will then accept the Messiah as their Lord. The Battle of Armageddon at the end is all about Israel. The enemy won't give up though, trying to destroy Israel, til the Lord returns. Where have I said I have no use for the book of revelation? I've posted from it and about it many times in this forum. It's the dispensationalists that don't understand it. Never said there are no more Jews. Quoting Paul is one thing - understanding what he's saying is another - the "common" understanding promoted by most theologies is in error and used out of context to the time Paul was writing. There is no justification for transporting Zech 13 and 14 2000 years past the 1st century AD. Could be some from the original, Jews are followers of a corrupt Judiaism which has very little resemblance to the religion of 1st century Israel. Where did Ms. Guided go? The battle of Armageddon is at the end, where 1/3 of Jews will b standing in Israel. Rev 19 regarding the battle showing the angels in prep for this final battle, is at the end, when the lord returns. I don't understand what the debate is. Jesus already came back....Israel will b destroyed? 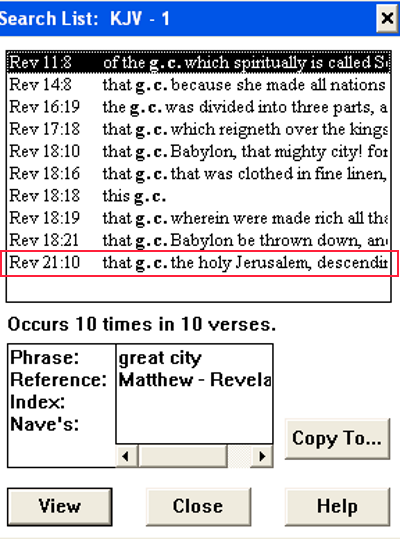 The book of revelation is about the destruction of the great city 1st century AD Jerusalem. Until you get that clear your understanding John's revelation will be off. John does not change the identity of the great city until Rev 21:10 where he sees the new great city. Who is Ms. Guided? Your play on words keeps me on my toes. You are just making stuff up - find where I said anything along those lines. If you're saying Israel will b defeated, I disagree. They will barely survive the Battle of Armageddon, which has not happened yet. In this battle, most nations will fight against her, but as in current wars, God's hand will help them survive. Many times odds were against Israel and God helped them every time. Refer to Zech 14, clearly this has not happened yet. Zech 14:1 'The Day of the Lord=God's wrath, where Jerusalem will b taken, then the Lord comes to the rescue, 14:3. Your understanding of many things biblical is questionable. If I were you, I would stop posting here for about a year, and do some serious fasting and prayer. Maybe get in with a group that has discernment. Study the word with the Holy Spirit as guide and counselor. All you are doing here is displaying your ignorance for the whole world to see. Your heart may be in the right place, i dont know nor question that. Yet just judging by all the time you devote to these boards, it seems to me something is off. Unless you dont sleep or work; and that's not to healthy either, if that is the case.